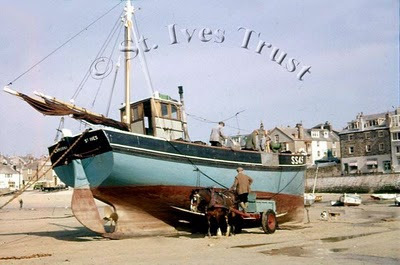 Long Liner Fishing Boat - St Ives Harbour - 1950s. I posted earlier this month that I was going to reduce the number of "What's On" posts. But there is a fair amount going on at the moment - so here's a selection from the coming week. Tonight (Sunday 31st) there are two pub quizzes - at The Queens Hotel and at The Union Inn. Both start at 8.00 pm and offer cash prizes. 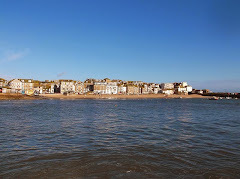 Tomorrow (1st) there is an illustrated talk at St Ives Infants School - Colourful St Ives In The 1950s - at 7.00 pm. Advance tickets are £3.00 from St Ives Tourist Information or £4.00 on the door. A fundraiser for Consols Pool Association. On Tuesday (2nd) St Ives Jazz Club are back at The Western Hotel with The Ken Church Quartet. Entry on the door is £10.00 or £6.00 (members). Doors open at 8.00 pm with music from 9.00 pm. On Wednesday (3rd) St Ives School of Painting have an art class - Life Drawing - at the school on Back Road and starting at 7.30 pm. No need to book, just turn up, cost is £7.00 which includes professional tuition. On Thursday (4th) St Ives Farmers Market is open at St Ives Backpackers from 9.30 am to 2.00 pm. As ever a great selection of fresh local produce. On Friday (5th) Carbis Bay Hotel are hosting a fundraiser for the Haiti Appeal - with proceeds split between Red Cross and local charity ShelterBox. Seventies band and disco - Neon Love Chicken. Fun auction and raffle. Free cocktail on arrival plus a buffet. Tickets are £25.00 - call 01736 795311 to book. They are also looking for items for the auction and raffle - so get in touch if you have something to donate. Who is giving the talk on 50s St Ives? An interesting week! Hi George. According to the poster I saw in Oates Travel the talk is by Brian Stevens - curator of St Ives Museum. Cheers. Steve.